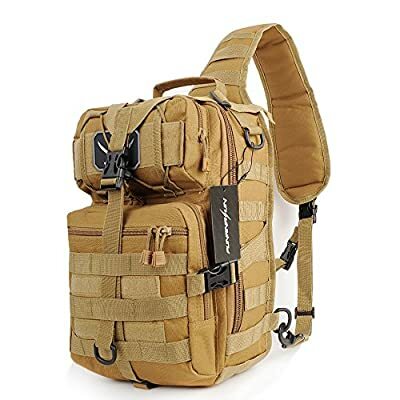 This functional and durable tactical sling backpack is being manufactured by high quality nylon material. 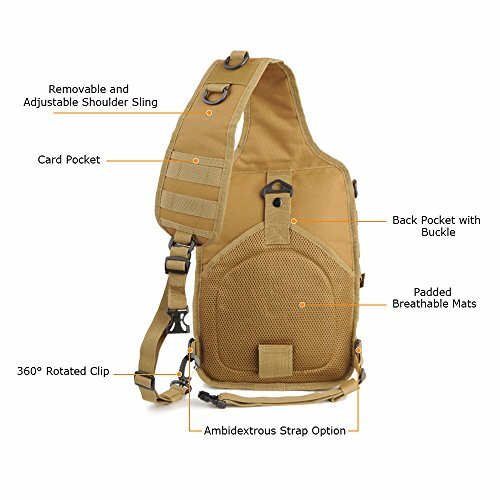 Main compartment with inner pockets can fit your daily essentials and tactical gears. The shoulder strap can be switched to the either side by the bottom clip, which offers ambidextrous strap option. 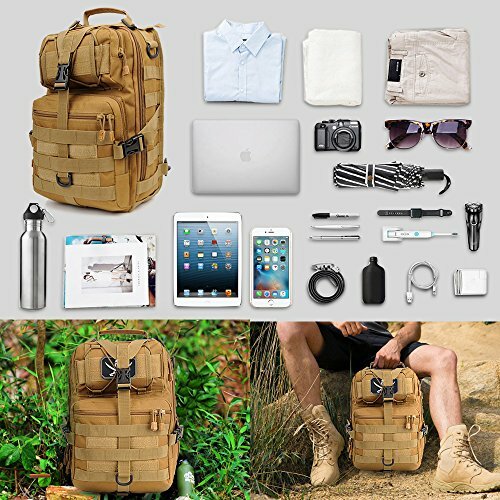 This bag is portable for day trip to theme parks, gym, pool, beach, biking, camping and hiking. 1 year warranty. Any quality problem for our product, please do not hesitate to contact us. We will provide our best customers service for you. 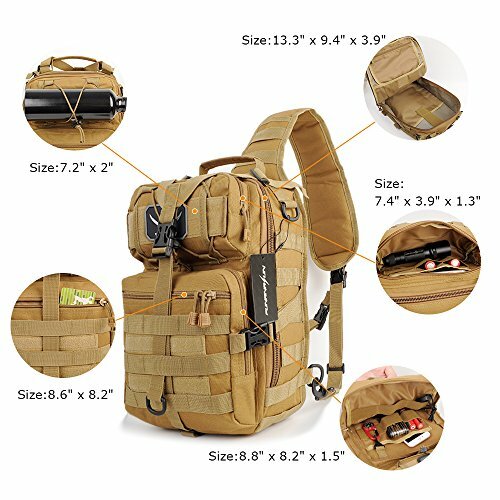 Tactical assault sling backpack filled size: 9.3"(L) x 3.9"(D) x 13.3"(H). Capacity: 20L. Constructed by durable 600D nylon material, and internal surface are made of waterproof material. The bug out bag has adjustable Y shaped load compression strap at the front to keep your load tight for better balance. 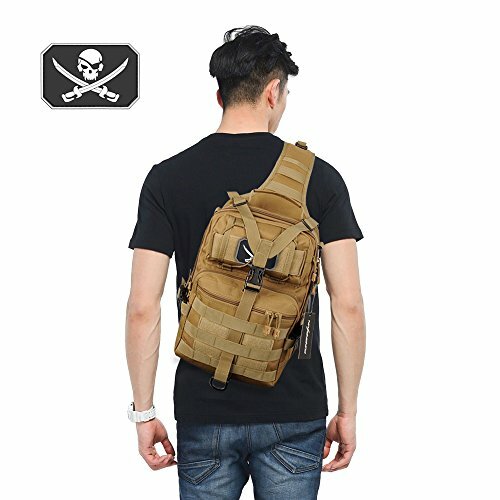 The Sling Bag can be used as a Book Bag for school, also could be utilized as a Range Bag for weapon, ammunition, hearing security, etc. Commuter bag backpack has adjustable and comfortable shoulder strap, and also has two smaller straps to help reduce the sway of the bag while moving, as well as being able to quickly change the side of the sling carry strap attaching for an easy right hand or left hand carry. 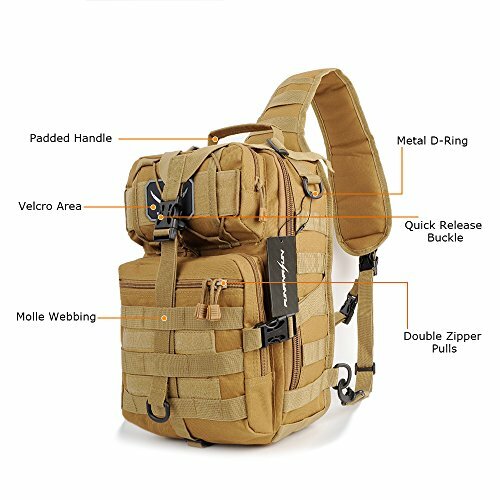 Tactical duty bag with MOLLE webbing system designed to be used in combination with other equipment, you can load tactical pouch, water bottle bag, flashlight holster, accessory kits and other molle gears. Excellent storages: 1 main compartment, 2 lower front compartments, 1 upper front compartment, 1 padded back pocket, 1 card pocket and 5 internal multi-slot admin compartments. Great for carrying your small tablet, eReader, as well as your wallet, keys, sunglasses and other essentials.